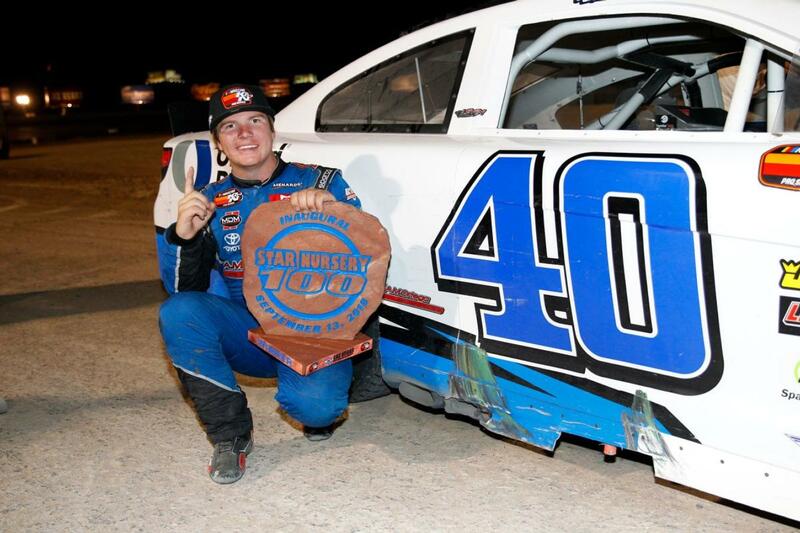 After a chaotic start, the first ever K&N Pro Series at the Dirt Track is in the books and it was Sheldon Creed who hoisted the trophy. Christopher Bell had trouble early and was leading late when he was penalized for jumping a restart. That gave the lead to Creed who held on through a final restart with two laps to go to seal the deal. "I thought we gave a couple away last year so it's great to come here and finish it off," said Creed, who scored his first series victory. 17-year old Hailie Deegan started from the pole and had to fight mechanical problems that had her car jumping out of gear all night long. During the halfway break, her crew came up with a temporary fix and from there, she patiently made her way back toward the front and tied her career best series finish. 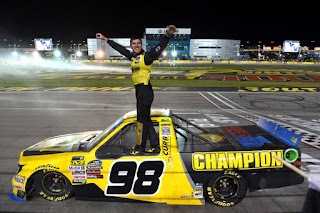 Las Vegas sports books had Grant Enfinger listed a clear long-shot for tonight's World of Westgate 200 but he performed more like a favorite. 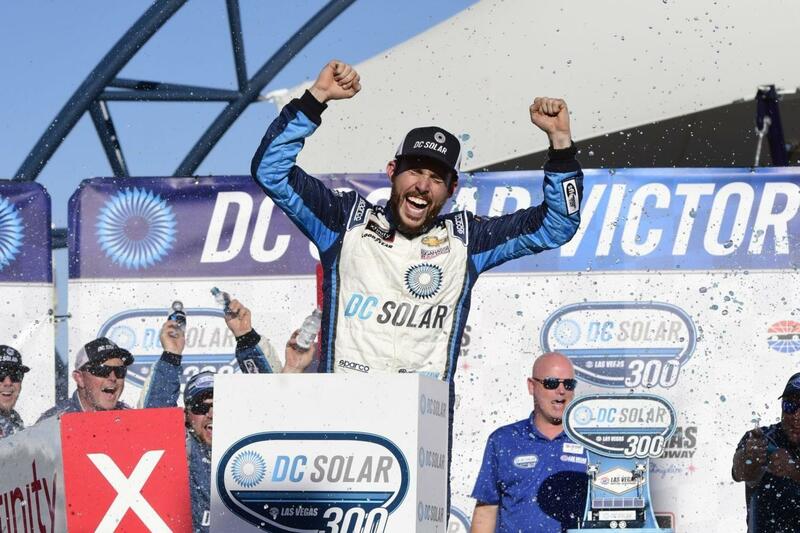 After starting third and winning the second stage of the race, Enfinger stayed in the hunt and sealed the deal with his first victory of the season. When the ThorSport Racing crew gambled on a fuel only pit stop late in the race, Entfinger capitalized on the track position and was in the right place when it counted the most. Close racing forced the race into overtime not once, not twice but three times. 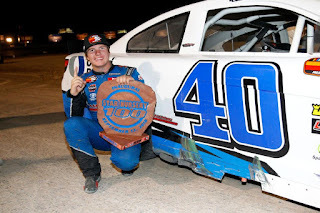 Brett Moffitt had the lead on the final restart but lost any chance he had at victory when his engine sputtered and failed to pick up the precious few drops of fuel left in the tank. 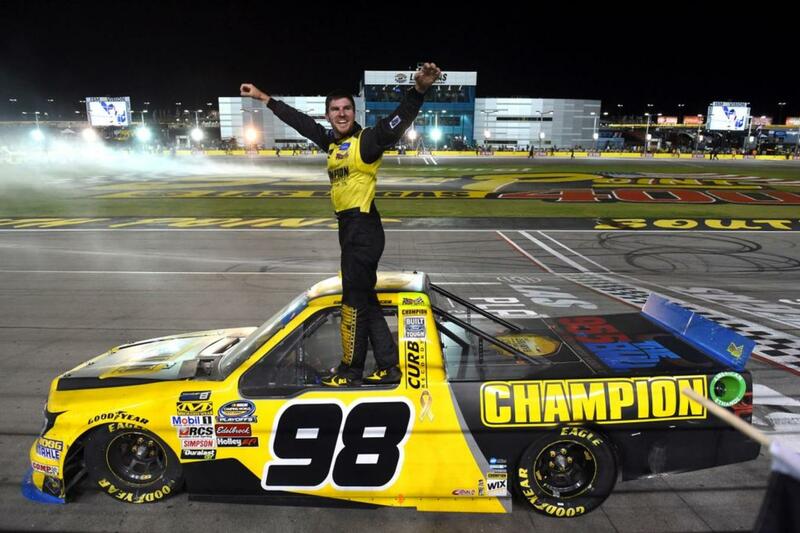 Enfinger was able to take the lead and hold off Johnny Sauter to score his second career victory. "This is kind of the culmination of all year," said Enfinger, who led seven times for 40 laps. "The truck was great. We had the best truck out there. We had to step it up and be aggressive tonight and all these guys did. We didn't have a good Ford F-150 yesterday during practice. These guys made it good. We had the best truck out here. Very, very proud of that." Ross Chastain won his first Xfinity Series race in dominating fashion as he led six times for 180 laps and stayed in front of several late race crashes to arrive in victory lane in his 132nd series start. "I'm just a watermelon farmer from Florida," said Chastain, after climbing from the car as a first-time winner. "I'm not supposed to do that. That's a testament that anything in life is possible." Justin Allgaier finished second, which allowed him to clinch the regular series championship. "That's amazing," said Allgaier. "This trophy right here is the dedication and hard work of all the guys back at the shop. I mean, they put their hearts and souls into it." Pole winner Cole Custer finished third and goes into the playoffs second in points, 44 behind Allgaier. Brad Keselowski and the No. 2 team are on fire after winning their third race in a row, and it couldn't come at a better time in the season. 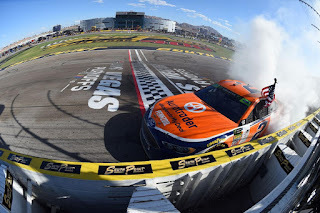 In addition to scoring his 27th series victory, Keselowski also handed Team Penske its 500th victory overall. Keselowski led eight times for 75 laps, including the final 22 laps that saw the caution fly no less than four times. The No. 2 Ford was strong on the restarts, which was key to the victory. "I didn't think it was ever gonna end," said Keselowski. "I was worried about running out of gas there at the end. What a special day for 500 wins for Penske, three in a row here, first win in the Playoffs. There are too many storylines for me to get it all right, but we're very thankful and very proud for all of them." Playoff driver Kyle Larson finished second after rebounding from an early unscheduled pit stop for a flat tire. Larson swapped the lead back-and-forth Keselowski four times over the final 30 laps and ultimately finished 1.3 seconds behind the leader. "I needed it to stay green," said Larson. "I was terrible on short runs today but once I could get the top going I was really good. Right when I moved up to the top in Turns 3 and 4 and pulled away the caution came out. Martin Truex, Jr. led 21 more laps than the winner. "Brad clearly found the horseshoe," said Truex. “Three races in a row he has won, he has not had the best car. He’s on a streak. That’s the way it goes."